One of my favourite jokes involves two nuns driving through Transylvania. Sister Bernadette and Sister Josephine proceed cautiously along an intrepid, winding road wary that they are in vampire territory. Out of nowhere an anthropomorphic bat-thing lands on their windscreen with a thud and gives a spittle-ridden, fangy hiss through the glass. The central comedic device used in this joke is also at work Cranky Capsicums… from Cross Farms. Boom. 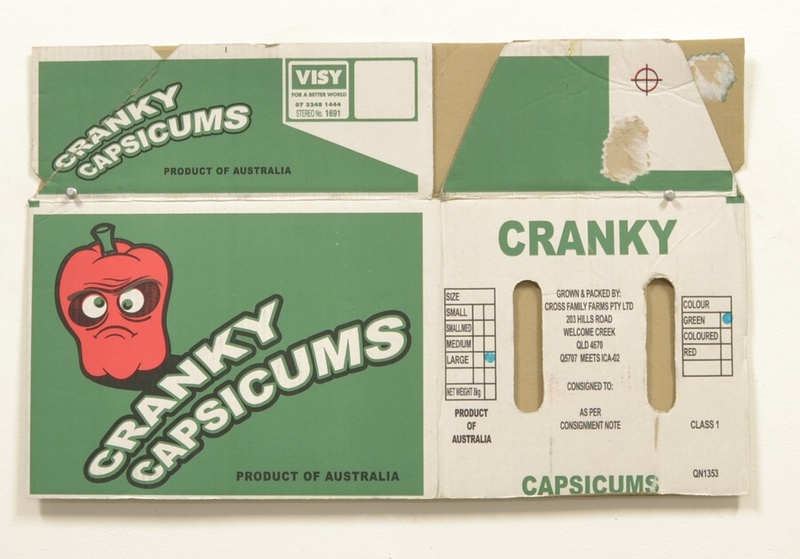 I was amused when I first encountered this box, as unlike other fruity characters in the fruit box world (which are invariably jubilant) the cranky capsicum looks very cranky indeed. It may seem to the casual observer, unaware of the farmer’s name, that Cranky’s is an exercise in unique or eccentric branding. But no! There is a sophisticated mechanism at work here – one that I have been wrestling with creating terminology for. As the process is used to devise a name for small garden-esque characters, I have assigned Gnomenclature to describe the process of creating such a name, and Anthropun as the noun for any individual mascot. A word nerd might do better, and I welcome suggestions, but they will do for now. The second box is from the farm of Matt Lizzio, who farms bananas in Tully, North Queensland. Lizzio’s banana box is what could be considered a classic fruit box design: the text is emboldened, arched, and shadowed and there is a large, simply defined banana bearing the word Tully at its yellow centre. The anthropuns are (unsurprisingly) lizards, and they are mounted symmetrically on each end of ‘BANANAS’. The fruit box in this sense is not unlike a coat-of-arms; it is a badge of pride and an embellished name. 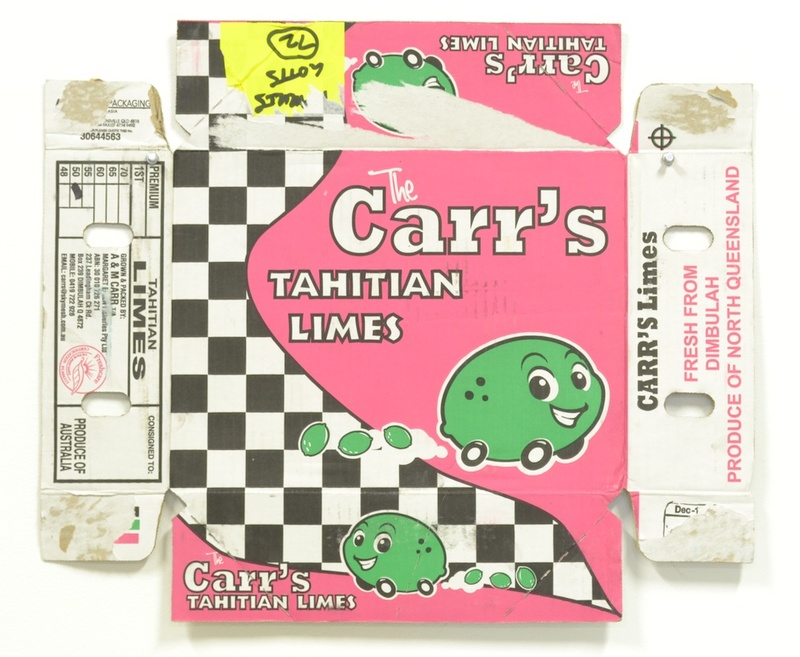 Our third box is The Carr’s Tahitian Limes, which is another anthropun from Dimbulah. * There is no prize for guessing the gnomenclature of The Carr’s anthropun. Its anthropomorphology is curious as it appears to be a tri-brid: part car, part lime and part person. Regardless of its odd breeding it is quite a charming little character. Bravo! *In the last blog entry (entitled Bug’s Citrus) the box’s anthropuns derived from its farmers O & G Bugno of Dimbulah.